At Earthworks we regularly have to load and check 3D seismic cubes and well locations. In order to check the relation between UTM coordinates and Inline/Crossline positions we have coded up a simple LocationCalc routine. This can be used to determine cube corners from an origin and orientation or alternatively from three corner points. 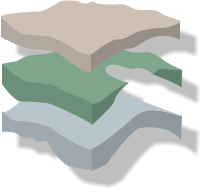 The 3D seismic cube definition is entered in the upper section of LocationCalc. Once the 3D cube is defined, the calculator option can be used to convert between locations defined in XY coordinates or Inline/Crossline. The model is implemented as a utility using Java. This particular applet is written using Java 1.2. If your browser cannot display the applet, you will need to install the Java 1.4 plugin available from SUN Microsystems. If we have two variables and wish to describe the co-relation between them, it is commonplace to use the correlation coefficient, R. The correlation coefficient is a measure of the linear relation between two variables. However, for a given correlation coefficient, how do we make some estimate of the validity of R in expressing the co-relation? For example, if we have a correlation of 0.9 is that a good or a bad correlation? How much confidence can we place on the correlation? If we compare two variables for which we have just a few samples, say 10, and observe a correlation of 0.8, is that better then a correlation between two variables, of which we have 20 samples, when the correlation is 0.7? To answer this question we can use a two-tailed Student T test, a standard statistical test which can be done in a spreadsheet. The test is made assuming n-3 degrees of freedom. see Kalkomey (1997) Alternatively, you can try the test out yourself using the Java applet above. (Note: this applet is written with Java 1.1, which requires IE4 or Netscape 4.05 or later.) If you enter the values described above you will discover that, although the second case described above has a lower correlation coefficient, we can actually be more confident about the result. The applet shows the probability (expressed as a percentage) of the correlation being spurious and also shows the approximate 95% confidence limits for the true correlation coefficient.